I have a bunch of exams to grade but instead I mostly spent today refactoring the Undead Debt code. I'm also shifting to another IDE - LiClipse. 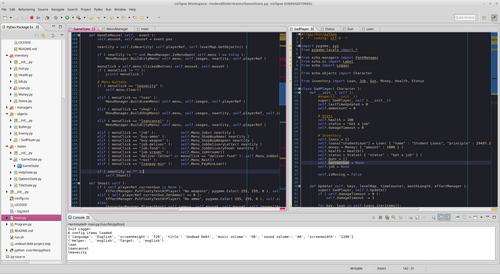 The Eric IDE was getting annoying because the project manager pane would constantly auto-scroll, which was annoying, and window management was a pain. Also it didn't auto-refresh the project manager when I added new files to my project?? So I'd have to restart it every time I added a new thing. LiClipse is based on Eclipse, so it is more widely used and aged; better feature implementation. When the refactoring, I changed up the inventory system so that I can eventually add multiple types of guns and multiple types of loans ("Loan" is an inventory item lol). I also want to work on making multiple zombie types and making traversing the world a little more strategic than just running and gunning. Also would like to add more to the environment - decorations, obstacles, etc. I should probably start working on more environment art soon, too.